Breakfast ham pop-pops, cows moo as they're being milked, girls feed clucking hens, and boys split wood--whack! 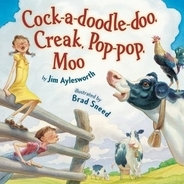 Rhythms, rhyme, and onomatopoeia are used to describe a day in the life of a farm family. 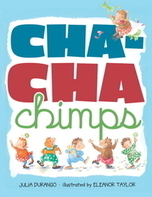 Counting and dancing go hand in hand at Mambo Jamba's, the place where hippos hokey-pokey and meerkats macarena and ten little chimps do the Cha -- Cha -- Cha until Mama Chimps says, "Time for bed!" Little Chick’s mother is all cluck and no action. Mama knows her old nest isn’t the cozy home she and her brood need. 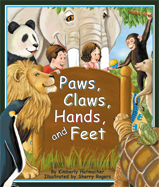 But whenever she vows to start building a new house, she’s distracted—by sweety-meaty worms, crunchy-munchy crickets, or picky-pecky corn. 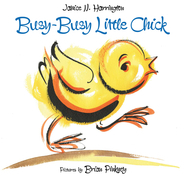 Luckily, her Little Chick is an industrious sort. While the rest of his family are stuffing themselves silly, he’s quietly working, bit by bit, day by day. even the wild things need some time to rest after a day of fast-footed play! 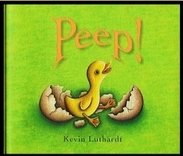 "Peep!" A baby duck breaks through its shell and immediately attaches itself to the first thing it sees -- a warmhearted young boy. The duck follows the boy home and soon the two are inseparable. But the baby duck is growing up. One day. . .Quack! When a flock of ducks flies by the boy realizes with a great pang of sorrow that his friend will have to return to live among its own kind. When a truck gets stuck under a bridge, it causes a terrible traffic jam that soon turns into a block party. When all attempts to remove the truck fail, two kids, some balloons, and a dog save the day.